Traditionally Labor Day is observed in many countries on May 1. However, some countries celebrate this holiday on other dates. For instance, American Samoa observes Labor Day on the first Monday in September, while the Independent State of Samoa celebrates this holiday one month earlier. 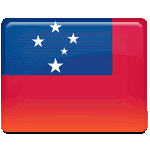 Celebration of Labor Day in Samoa originates from American holiday, established at the end of the 19th century. During the 1890s the labor movement gained its peak as Pullman Strike, a nationwide railroad strike in the USA, and witnessed the death of number of workers. After the strike the legislation making Labor Day a federal holiday was rushed and President Grover Cleveland signed the bill into law. Celebration of Labor Day in Samoa is marked by singing traditional songs and dancing. One of the most interesting event is a longboat race, that attracts attention of the islanders and the tourists. A street parade is also organized to mark the importance of the labor unions and workers in everyday life of Samoa.